LAHORE: At his house on busy Mall Road in Lahore, environmental lawyer Rafay Alam runs three air purifiers around the clock, keeps his windows shut and stuffs towels into the gaps under his doors. Some winter days, when the city’s smog is particularly bad, “I don’t send my daughter to school,” he admits. “I am not going to risk permanent damage to her lungs.” Pakistan’s second-largest city is choking on smog, driven in part by smoke from bricks kiln and steel mills, burning of rice stubble and garbage, growing numbers of vehicles on the road and large-scale losses of trees as the expanding city makes way for new roads and buildings, residents say. Many in the city of 11 million complain of headaches and burning eyes and throats as air pollution levels this winter have on some days hit five times the legal limit, according to a global air quality index that many in Lahore check via the AirVisual phone app. Alam thinks it’s time for the government to declare a public health emergency on the worst days, when the air is full of dust and pollutants that can cause health issues including asthma, lung damage, bronchial infections and heart problems. “The air pollution in Lahore is bad throughout the year, but in the winter there is temperature inversion where a layer of warm air is prevented from rising and it traps all the pollutants below it, which renders them visible,” he said. Lahore, once known as the Garden City but now choked with cars, regularly figures on air quality indexes as as one of the most polluted cities in the world – and many of the pollutants are also drivers of climate change. 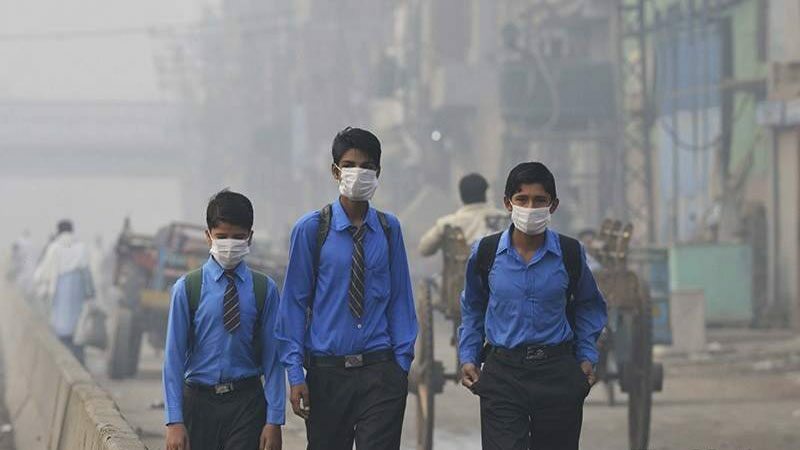 Prime Minister Imran Khan’s government, which came to power four months ago, has restarted air quality monitoring in Lahore after the previous government ceased it two years ago, said Malik Amin Aslam, the prime minister’s climate change advisor. During that two-year period, air quality monitoring stations in the province weren’t working because of a lack of funding and capacity, Alam said. The prime minister, who grew up in Lahore, said he sees tackling the city’s smog problem as a priority. “It is a serious issue that must be addressed,” Khan told his cabinet. In November, the Lahore High Court ordered the Punjab provincial government to implement recommendations of the Smog Commission, set up by the court in 2017 to look at the drivers of smog and find ways to reduce them. Those included curbing emissions from factories, closing brick kilns that fail to use fuel-efficient technology, and fining polluting vehicles and farmers burning rice stubble in the winter. The commission also ordered the planting of trees in urban areas and efforts to spread environmental awareness in schools. Aslam said the government now has a team traveling around Lahore reading the city’s air quality monitors, with the data feeding into the city’s own air quality index. That index, updated daily, is posted for public use on the Environmental Protection Department’s website. Since coming into office, Khan has organised meetings with brick kiln owners and won a two-month winter shutdown of factories in 12 districts, including Lahore. The government has also pushed brick kiln owners to shift to cleaner technology, offering loans to make the switch, as well as issuing fines for kilns that operate using the dirtiest technologies, such as burning used tires. The Environment Protection Department has fined farmers who burn crop stubble – a traditional practice – and is looking at promoting zero tillage farming as an alternative, though making the switch will be costly for farmers, Aslam admitted. As well, the government is considering setting higher emissions standards for vehicles – but warned the switch could make petrol “more expensive for consumers as a result”, Aslam said. The Environmental Protection Department said the level of smog pollution was lower this year than last in Lahore because of anti-smog measures already underway. Alam said monitors installed in his house continue to show hazardous levels in his neighbourhood. “It’s not just brick kilns and farmers who are causing air pollution. Pakistan uses the most polluted fuel in the world – tackling this problem will require a tremendous change in the energy and transport sectors of Pakistan,” he said. He said the country needed a nation-wide system of air quality monitors in its cities to better understand what is happening and drive action. Cutting smog would have other benefits as well, he said. “By reducing greenhouse gases that cause air pollution you are also addressing climate change. The two are linked”. Abid Omar, who founded the Pakistan Air Quality Initiative, a non-profit group that publishes data about air pollution and its health impacts, agreed that a broad approach is needed. “We have to reduce air pollution at the source, be it industry, agriculture, urban waste or transportation. This will require time, money and planning,” he admitted.